Americans stumble across the landscape in a love-drunk stupor borne out of our archnemesis, the crossover. “Give me unusually heavy and tall wagons that are okay at a lot of things but truly great at not much,” they cry. And because of the insatiable hunger, the Chevy Sonic, the Chevy Impala, the Ford Fiesta, and the Ford Taurus may all die, according to a Wall Street Journal report. Oh, and the Ford Fusion might go, too. 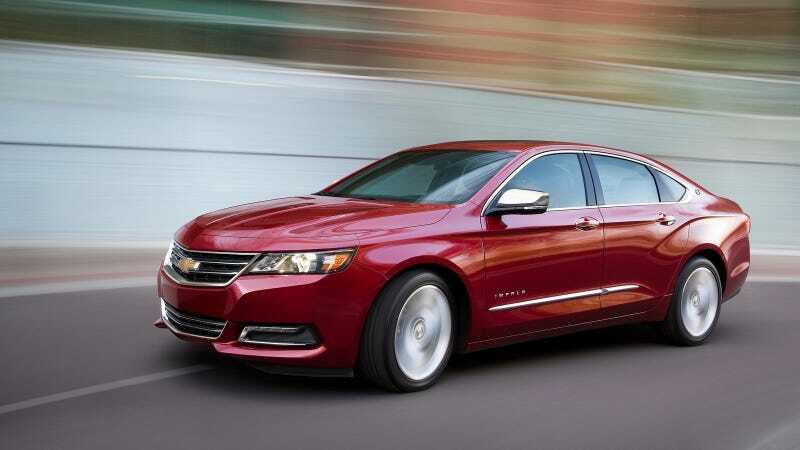 GM, for instance, is also considering discontinuing the Chevy Impala large car in the next few years, these people said, a decision that would kill a 61-year-old car line. Ford Motor Co, meanwhile, plans to stop building the Fiesta small car for the U.S. market within the next year, and discontinue the Taurus large sedan, according to people briefed on the plans. Executives are still considering the future of the Ford Fusion, once billed as an answer to the Honda Accord or Toyota Camry, these people said. To us this seems incredibly shortsighted. The crossover boom has been driven in large part by a healthy economy and cheap gas prices. But that seemingly healthy economy is threatened by a looming trade war with China that has already sent stock markets plummeting and a presidential administration that today expressed the desire to keep most people poor. Gas prices, as well, can be extremely volatile and the global market is highly dependent on Middle East stability, which is fine, except the Middle East isn’t very, you know, stable. And that’s without even mentioning the terrifying subprime auto loan bubble. Though that’s not exactly a denial of the rumors of the death of the Fiesta, Taurus, and Fusion. Chevy declined to comment. We’re going to start building a Prius stockpile now, for the coming Second Carpacolypse. See y’all in a couple of years when we’re rich as hell.